The following notes are primarily taken from the Content Creation User Group meeting, held on Thursday, January 4th, 2018 at 13:00 SLT. For the purposes of Animesh testing, the meetings have relocated to the Animesh4 region on Aditi, the beta grid – look for the seating area towards the middle of the region. The meeting is chaired by Vir Linden, and agenda notes, etc, are usually available on the Content Creation User Group wiki page. Medhue Simoni live streamed the meeting, and his video is embedded at the end of this article – thanks to Medhue, as always, for the recording. Where the video is referenced, time stamps to the specific point of the video are provided in the text – click on them to open the video in a separate browser tab at that point. “I like the name ‘animated objects’ because I think it’s unambiguous, but it takes a long time to type!” – Vir Linden joking about the name “Animesh”. The goal of this project is to provide a means of animating rigged mesh objects using the avatar skeleton, in whole or in part, to provide things like independently moveable pets / creatures, and animated scenery features via scripted animation. It involves both viewer and server-side changes. Can be any object (generally rigged / skinned mesh) which and contains the necessary animations and controlling scripts in its own inventory (Contents tab of the Build floater) required for it to animate itself. Can be a single mesh object or a linkset of objects (link them first, then set them to Animated Mesh via the Build floater > Features). Has been flagged as and Animesh object in the project viewer, and so has an avatar skeleton associated with it. Can use many existing animations. Will not support its own attachments in the initial release. These are considered options for follow-on work, possibly starting with the notion of a body shape (to help with more fully-formed NPCs). [33:24-34:10] There are around 14 “must do” items remaining on the list of work to be completed for Animesh before it can really move towards release. Some of these are fairly major – such as performance profiling (tri, count, LI, etc., limits evaluation, and so forth). There are also a number of bugs to be fixed or determined to be trivial enough so as not to prevent Animesh from moving to release / require work outside of Animesh. [1:12-1:54] Animation Playback issues: as highlighted at the December 14th meeting, animations already running on an Animesh object don’t necessarily play for those entering the region where they are running, or update correctly when camming to them for the first time. It now appears this is a race condition issue, with the viewer receiving information on the animation before it has rendered the object being animated, resulting in the animation being ignored. Vir is confident that now the cause has been found, the issue can be fixed. [3:33-13:52] There has been a long-standing issue with rigged / static meshes using transparencies (blended or masked), which causes shadows cast by the latter to render incorrectly (shadow rendering conforms only to the geometry silhouette). 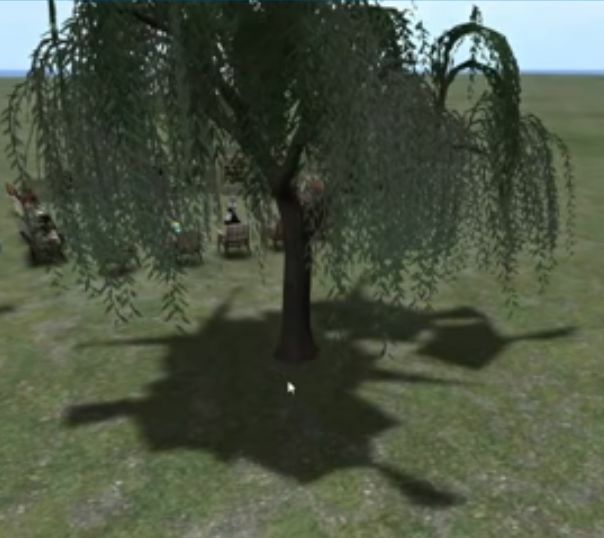 Animesh can exacerbate this issue on some objects (note the image of the tree on the right, and how the shadows of the leaves (faces using transparencies) are render. As this appears to be a rendering pipe issue, rather than a specific problem with Animesh, it may require investigation and resolution by those handling viewer rendering pipe issues, If so, this could take time to complete, and so is currently being viewed as outside of the current Animesh project, and not a blocker to any initial deployment of this phase of the Animesh work. [43:12-47:25] As previously noted in these updates, worn mesh cannot be simply “dropped” in-world. It has to be detached to inventory and then rezzed in-world from there. This makes the ability for people to pick up Animesh pets, carry them, then put them down in-world awkward. The Lab’s view is that as dropping mesh directly in-world was never considered, the code-path for achieving this is not clear, touching as it would on a variety of elements: land impact calculations, physics updates, etc; there’s also a risk of forcing users to re-log should a No Copy pet be dropped and fail to rez in-world, in order for it to correctly register in their inventory again. However, pets are seen a major use for Animesh, so not having a means by which they can easily be put back down in-world after being carried is seen as a potential limitation in the adoption of Animesh by pet creators; as it is, many have kept to using (render-intensive) sculpties with their pets, simply so they can retain the ability to pick them up and then put them back down in-world, rather than having to force users to detach and re-rez the pet after holding it. The issue is again being that back to the Lab for further discussion. [14:49-17:12] Global scaling and resizing: not something that is going to be implemented for Animesh with this initial work, but may be added later. It is possible to get the effect of global scaling on a rigged object by scaling in joint in the hierarchy individually, but this may not give consistent, expected behaviour. [17:32-20:29] Setting position and rotation of rigged meshes: slight confused discussion on whether rigged mesh attachments can be re-positioned / rotated. Generally, rigged meshes cannot be re-positioned / rotated as their the vertices are recorded to set distances from the avatar bone. However, Animesh attachments (which have their own skeleton) should be capable of position / rotation changes releative to their attachment points. [20:44-24:40] Slider support for Animesh: avatar shape sliders are not supported in the initial Animesh work, as these require a shape to be associated with an object which, as per the summary notes for the project (above), is considered a possible Animesh follow-on project. For this phase of the work, shape changes can only be defined by setting joint positions / using animations. The reason why shapes, sliders, etc., are seen as a potential follow-on project is that they will require an extensive overhaul of the baking service (which manages appearance information), so that it recognises Animesh objects and can handle them. The current work to update the baking service to support 1024×1024 textures. An intended follow-on project to actually support baking textures onto avatar mesh surfaces (and potentially other mesh objects as well). This has yet to fully defined in terms of implementation and when it might be slotted into SL development time frames. This work does not include normal or specular map support, as these are not part of the existing baking service. [52:58-53:23] No news this week; Vir will see if Anchor Linden can attend the next CCUG to provide an update / discuss the project. A set of environmental enhancements, including the ability to define the environment (sky, sun, moon, clouds, water settings) at the parcel level; a new environment asset type that can be stored in inventory and traded through the Marketplace / exchanged with others; scripted, experience-based environment functions, an extended day cycle and extended environmental parameters. This work involves both a viewer updates (with a project viewer coming soon) and server-side updates. [54:02-54:24] As per Bakes on Mesh, no update for this week, but there is an internal project meeting at the lab to discuss the work scheduled for Wednesday, January 10th, so there should be an update at the next CCUG meeting. [25:41-31:17] Mesh object names: Due to a limitation with Collada .DAE files mesh objects for upload via the official viewer cannot currently have spaces in their names. However, the Lab will be adopting the Firestorm work-around for this by allowing the use of underscores in object file names. This point of the meeting is s brief discussion over how the changes have been implemented by Firestorm / are being implemented by the Lab, and what Firestorm might want to do to be consistent with the Lab’s update. [36:30-41:58] Mesh uploads: recognising linkset object names: currently with mesh objects, only the name of the root item in a linkset is recognised, everything else is simply “object”, rather than carrying over any naming convention used when creating a model (e.g. “dog”, “dog_head”, “dog nose”, “dog_tail”, etc., or some variation of more useful naming). There are assorted complexities with the issue (e.g. no direct correspondence between objects in the original scene description and objects as they are imported. Vir has requested a detailed feature request to be filed (if one hasn’t been already) on what people would like to see and how linkset uploads could be better managed for consistency of item naming. [48:28-48:50] Additional sliders for Bento bones: during the Bento project it was decided not to add additional sliders for any of the new Bento bones which could not be linked to work with existing sliders. However, it was seen a possible future project. Right now, it is not something on the SL roadmap. [49:09-52:47] Scaling by animation for additional Bento bones: this was looked at as a part of the Bento project, but the current animation format doesn’t support this, and so would have to be re-worked. There are no plans to do this at present. See the notes above on global scaling and resizing of Animesh as well. Reading your blog to catch up on Animesh developments. Am i right in thinking that in it’s first release state an animesh object rezzed on the ground will not have the ability to be resized via edit like a normal object? As Animesh objects contain an avatar skeleton, they are subject to similar constraints as avatars when it comes to joint positioning, etc. But stretching edit resizing should (to a degree) be possible.